It’s Post WW1, and Britain is overcast with grief and despair after the loss of so many lives, with many taking comfort in the belief that their dearly departed live on as ghosts. 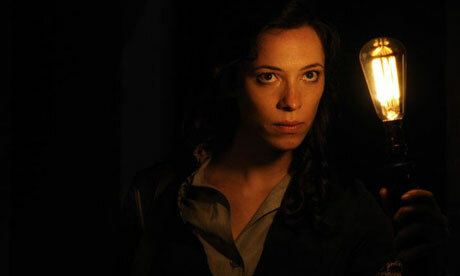 Rebecca Hall plays Florence Cathcart, an author and hoax exposer, using science and an arsenal of Sherlock-esque contraptions to disprove the existence of ghosts. After the success of her book ‘Seeing Through Ghosts’, she’s approached by Robert Mallory (Dominic West) to investigate the sighting of a child ghost at his boarding school which the students are convinced caused the death of another pupil. Cue creepy, pale children and a creaky Scottish mansion, as Florence’s beliefs are tested when she starts to see what she thought to be impossible. Similar to 2004’s The Others, it’s a haunting and foreboding film that keeps you guessing until the end. To begin with, the plot is steady, and somewhat predictable, before it takes a dramatic turn; to say the plot twists would be an understatement- it goes completely round the bend, losing its grip in the process. The mystery becomes ridiculous and convoluted, and the addition of an attack is a shoddy attempt to hold our attention with a bit of action. However, terrific performances from Hall, West, and Imelda Staunton are enough to keep the story going. Posted in Arts and tagged film review, rebecca hall. Bookmark the permalink.